Aug. 20, 2018 - Artificial intelligence, X-ray scanning, closed-loop technology, industry 4.0... Where can sawmillers learn about all these hot topics in just one day? 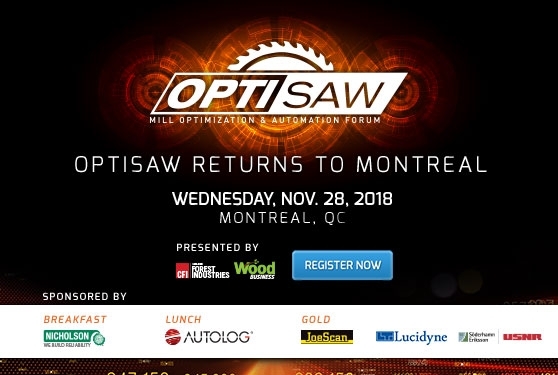 OptiSaw Mill Optimization and Automation Forum, hosted by CFI magazine, is returning to Eastern Canada to hold an information-packed event in Montreal on Nov. 28. We’ve rounded up speakers from industry-leading manufacturers to explain their cutting edge sawmilling technologies and processes, and to share invaluable ideas about getting the most for your money. An automated scanner/optimizer that learns to grade lumber like a human grader learns: by example. A new real-time automated system for identifying and separating wood species based on new technology using near infra-red spectroscopy. Don’t wait to sign up. The forum is limited to an exclusive audience of sawmill management and owners, process engineers, continual improvement managers, optimization staff, researchers and design consultants. Register now for our early-bird rate to secure your seat at the table.